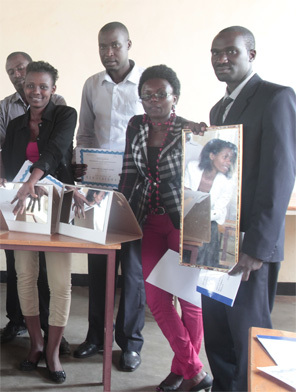 The first ETPP Mirror Therapy Training Workshop for Rwandan medical professionals was held on June 1, 2013 at St Paul Economat General, Kigali, Rwanda. Those who received certificates to practice Mirror Therapy included five nurses, two physiotherapists and one psychologist. The four-hour Workshop was conducted by Jean Luc Ngarambe, an accredited Physiotherapist and the first certified End The Pain Project Mirror Therapy Trainer in Rwanda. Many amputees suffer Phantom Limb Pain in their missing limb, often for years after the amputation. Phantom limb pain can be safely eliminated in just four weeks with simple, non-invasive Mirror Therapy. The mirror reflection of the amputee’s good limb during specific exercises to retrain the brain’s sensory pathways, releases the pain. End The Pain Project’s mission is to offer information and mirror therapy training for those aiding amputees in countries such as Rwanda where conflicts, trauma and disease make amputation more prevalent. The ETPP Mirror Therapy Training Workshops are ongoing in Rwanda and depends solely on public donations.